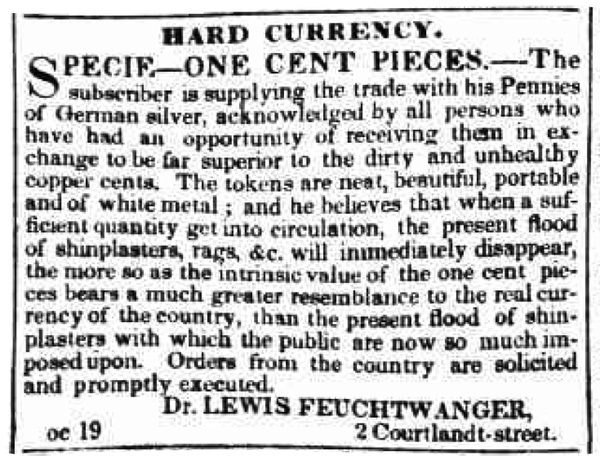 After the panic of 1837 and the subsequent 5 year depression thereafter known as the Hard Times, Lewis Feuchtwanger, a pharmacist, issued tokens made of German Silver, an alloy primarily made of copper, nickel, tin, and zinc. 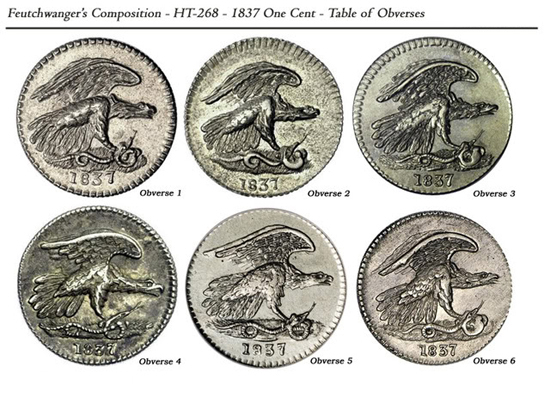 It was during these times that much of the coinage in the U.S. was hoarded and disappeared from circulation. 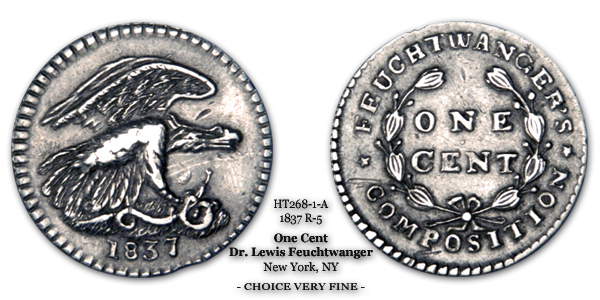 Decades before the use of nickel-alloy for circulation coinage in the United States, Feuchtwanger proposed his token’s alloy to Congress as a lesser expensive metal for use in the minting of U.S. coppers. Though Congress entertained his idea, they ultimately turned down his proposal. Feuchtwanger didn’t let rejection by Congress stymie his entrepreneurial efforts. Instead of giving up on the idea, he chose to market his “silver” composition to store keepers, merchants, and the public at large. Out of his pharmacy at 2 Courtlandt Street in New York City, Feuchtwanger dispensed his tokens, often handing them out as change. Many remained in circulation for decades, with some being traded as currency up to and during the Civil War. 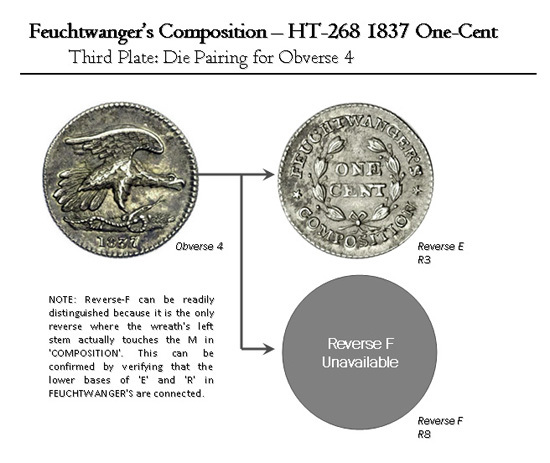 In addition to his one cent tokens, Feuchtwanger also minted undated one cent tokens, and 3-cent tokens made of the same alloy. Moreover, additional store card tokens of varying values were produced using his metal composition. 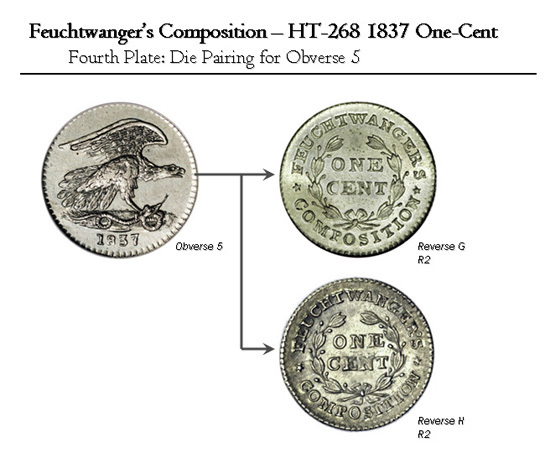 In total, there are currently 14 different known varieties of Feuchtwanger’s One Cent pieces. Many are quite common and can be readily obtained in the collectors market. Other varieties are quite rare. 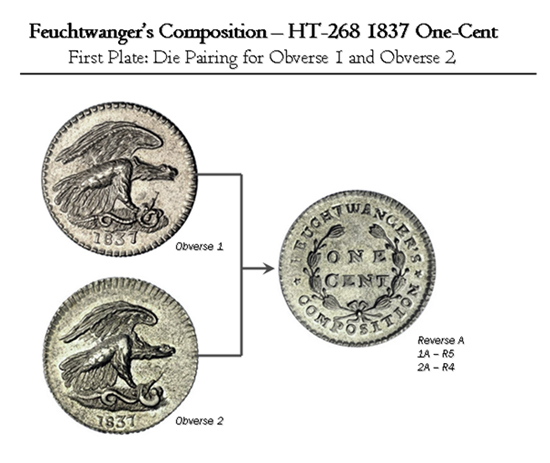 The specimen pictured below is the HT-268 (1-A) Feuchtwanger Cent variety. Having survived in Choice Very Fine grade, you will notice obverse wear on the specimen, exhibiting tell-tale signs that the specimen had been circulated in commerce. As with most Feuchtwanger Cents, those that circulated most commonly exhibited wear along the length of the serpent, as well as along the highest points of the eagle’s feathers. Below are instructions on how to attribute a Feuchtwanger cent. I recommend using the above plates as a visual aid. To attribute a Feuchtwanger’s Cent, first perform Obverse Diagnostics, then perform Pairing. Does there exist a curved line above the ‘8’ and ‘3’ in the date? If yes, it is an Obverse 5. If no, go to step 2. Counting from RIGHT to LEFT starting at the eagle’s leg, is the third tail feather clearly NOT touching the ground? If yes, it is an Obverse 3. If no go to step 3. Counting from RIGHT to LEFT starting at the eagle’s leg, is the first tail feather touching the top of the snake? If yes, go to step 4. If no, go to step 5. Is the base of the ‘7’ in the date higher or equal to the base of the ‘3’? If higher, it is an Obverse 1. If equal, it is an Obverse 6. Is the number ‘3’ in the date lower than the number ‘1’? If lower, it is an Obverse 4. If higher, it is an Obverse 2. These two obverses can only be paired with Reverse A. Therefore, based on Obverse Diagnostics, the specimen is 1-A or 2-A. Does the reverse have two berries inside the top right of wreath? If yes, it is a Reverse C. If no, go to step 2. Does the reverse have 12 or 13 berries? If 13 berries, it is a Reverse G. If no, go to step 3. In ‘CENT’, does the top horizontal stroke of ‘N’ touch the top horizontal bar of ‘T’? If yes, it is a Reverse E. If no, go to step 4. In ‘ONE’, is the top of the ‘O’ about equal to the top of ‘N’, or is it distinctly lower? If about equal, it is a Reverse B. If distinctly lower, it is a Reverse D.
Does the wreath’s left stem touch the ‘M’ in ‘COMPOSITION’ and also does the lower bases of ‘E’ and ‘R’ in ‘FEUCHTWANGER’S’ touch? If yes, it is a Reverse F. If no, it is a Reverse E.
Is there a berry to the left or right of the bow inside the wreath? If left, it is a Reverse H. If right it is a Reverse G.
To the left of the bow, is there a stem without a berry? If yes, it is a Reverse I. If no, go to step 2. Does the reverse have 12 or 13 berries? If 13 berries, it is a Reverse G. If 12 berries, it is a Reverse A. The author has over 30 years experience in North American numismatics. He is the author of numerous articles about exonumia, including those about tokens, scrip, and the public who used them. He is a member of the ANA, VNA, ACC, C4, CWTS, TAMS, MD-TAMS, AVA, NSCA, and NumisSociety. Your Feuchtwanger Cent information and photo display is very fine with one exception. After the “Table of Reverses”, you immediately go to “Second Plate: Die Paring for Obverse 3”. 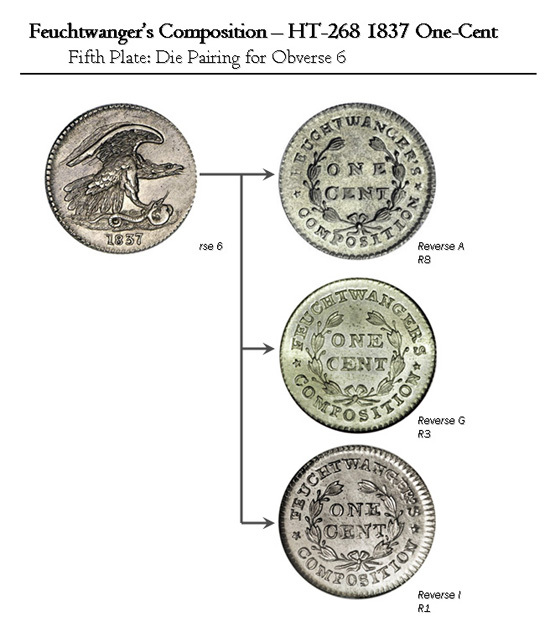 However, you have omitted “First Plate: Die Paring for Obverse 1 and Obverse 2”. 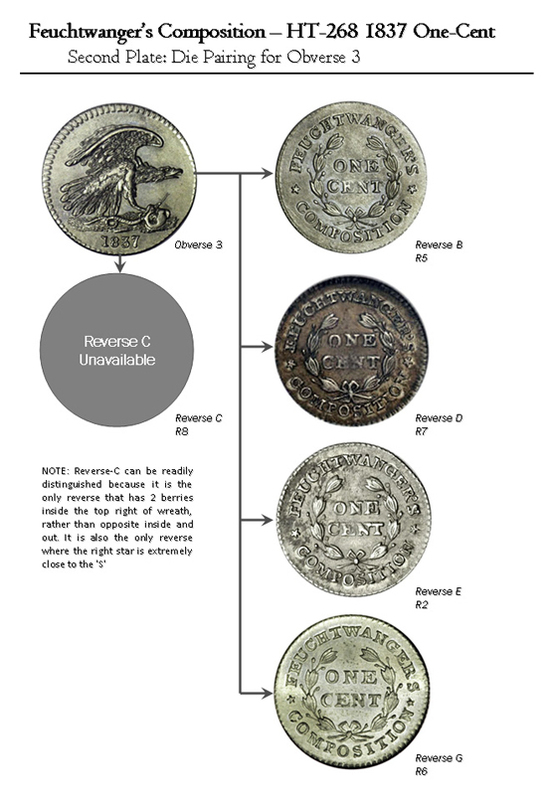 This First Plate shows photos of Obverse 1, Obverse 2, and Reverse A with rarity listings 1A – R5 and 2A – R4. You would be doing the numismatic hobby a favor by including this “First Plate” from now on. Thanks for pointing this out. The First Plate has been added. It was inadvertantly omitted when the site was migrated over to its new CMS. Thank you for all your good information on the Feuchtwanger cent. We currently have a few choice pieces up for auction on our private site if you want to bid or just use for reference purposes. It’s nice to see interest in Feuchtwanger and his interesting story. It appears you made a typo. Indeed Wayne, I made I typo when I wrote my instructions; it has been corrected. Thanks again! Hi, using your information I believe I have a feuchtwangers one cent coin 3E R2. I think it is in good condition, how do I find out how much it is worth and how would be the best way to sell it. Just so you know I have no knowledge about coins so any help will be much appreciated. First I’d recommend validating that indeed you have a 3-E. You are welcome to send me a clear photo of its obverse and reverse via email and I’d be happy to validate. This is just in case it’s not a 3-E, but rather a much more rarer variety. Once validated as a typical variety, in my opinion, the easiest way to sell such an item is to put it up for auction on ebay. In the case of Feuchtwangers, although there’s no guarantee, bidders will usually compete for a specimen until the hammer-price reaches its usual market-price. I have a picture of the front and back. I don’t see a way to attach them here so if you will send me an email I’ll send them to you. They are pretty large 1.25MB and 1.41MB, do you want me to compress them or send them one at a time? I really appreciate you taking the time to help me out with this. Feel free to email them to the support email address listed on my ‘contact’ page. The file sizes are ok. I’ll keep my eyes peeled for your email. Did you get the two files I sent you? Just wondering what you thought of my coin. I examined your photos you sent. You indeed have a 3-E variety. Nice job on the attribution. Based solely on what I can make out with your pictures, I do not see any obvious damage that will preclude it from obtaining a grade from PCGS or NGC. So you have two choices — sell it raw (unslabbed) or send it in to get graded and “slabbed” from PCGS or NGC. NGC will label the slab with your specific variety, PCGS does not. Perhaps you might want to peruse ebay and compare other 3-E specimens to give you an idea. Fantastic site – I wish there were more sites describing coins and die matching that are as easy to follow and as complete as this write up. Outstanding. Thanks! Hi all. I’ve been a collector since age 7 in 1964, and a dealer since 1985. 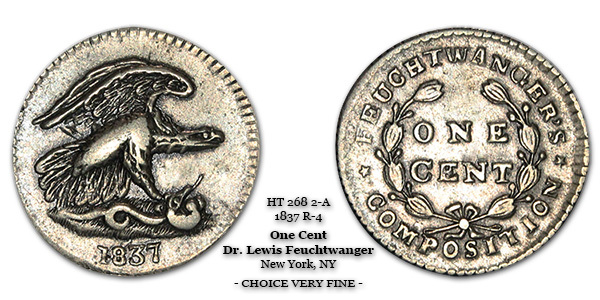 At about age 14, I acquired a Feuchtwanger cent without knowing anything about them. It was subsequently stolen when my home was broken into and my entire collection stolen. Discouraged, I gave up collecting. Then after college and the navy, I opened a collectibles store. Mostly comics and sports cards, but I began to acquire coins again, rebuilding my collection and starting to deal in coins as well. I chanced upon another Feuchtwanger and bought it, still without knowing anything about them. Fast forward 10 to the internet age and Ebay, and I’ve learned a lot more, and now own over 20 of them, including 3 three cent pieces. Having read the comments, there seems to be some knowledgeable people making comments, and there are still a lot of gaps in my knowledge. So if anyone can answer my questions, I would appreciate it. Is there a club or forum specifically for Feuchtwanger collectors? I can’t find one mentioned on the net, and if there isn’t one, would people be interested in forming one? Is there a grading guide? I have graded specimens from ANACS, PCGS, NGC and ACG that appear to have been graded with significantly different standards. 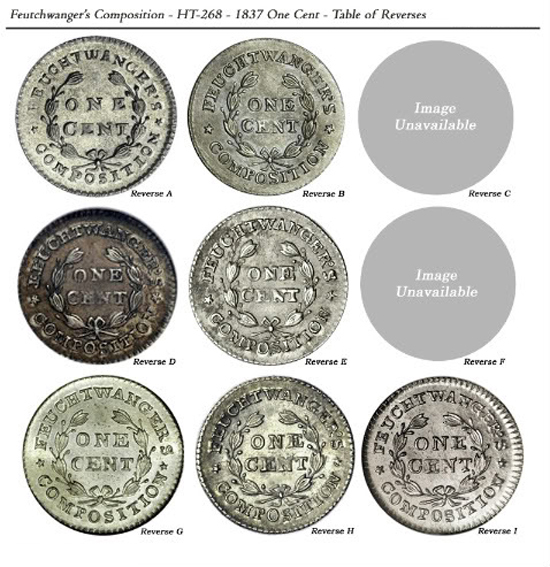 It appears to me that striking standards were low, and that many Feuchtwangers were struck with worn dies which make it difficult to tell if coins are worn from handling or just poorly struck from worn dies. I have a 3 cent Eagle that was sold to me as an electrotype. It’s dark grey, possibly an iron alloy, and undated. Does anyone know anything about these? Does anyone know of other Feuchtwangers besides the 14, 1 cent varieties, the three cent and the 12 1/2 cent? One article I read mentioned an undated 1 cent, which I’ve never seen mentioned anywhere else. If anyone can answer my questions, is interested in a Feuchtwangers collector’s group, or is interested in trading, let me know. I have requested membership to your group. I recently inherited several of these coins. One cent has Low 120 written on the holder. I also see several of these listed that way on ebay. What differentiates the Low 120 from the others? 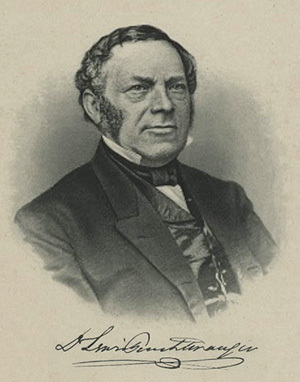 Russell Rulau, much later, also cataloged many of the same private tokens that Lyman H. Low cataloged, including the Feuchtwanger one-cent pieces. Each token in Rulau’s catalog was listed by a “HT” number. HT = Hard Times. I recommend that you follow the instructions provided to determine which exact varieties of the Low 120/HT-268 pieces you have. Please send me photographs of the specimen to the email address located in the contact section of the website. I will do my best to attribute it for you.